Get Your Order In! 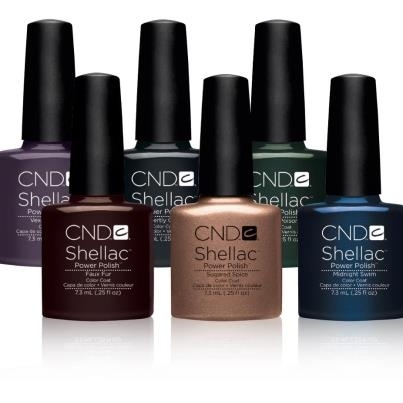 CND Shellac Fall 2013 Colors Now Available for Pre-Order! Fall is ALMOST here! I don't know about you, but I absolutely love the fall and all the new nail polish colors that come along with it!! I tend to keep my nails dark all year round, so when new colors come out, it is super exciting! The new CND Shellac Fall Forbidden Collection are a group of deep, rich, and romantic colors. Explore the darker side of romance for fall! Pre-Order them now to ensure you don't miss out on this exciting collection! They will be available to ship mid- late August. Well, fall has FINALLY arrived....the leaves are changing, the air is crisp, and the new Fall Shellac Colors are available to ship! Pick them up at Pure Spa Direct today, and make your clients happy! Your clients will be clamoring for new, warm, dark colors, and this collection is sure to be a hit! It features a little something for everyone, with a modern hint that will keep your clients coming back for more. Shellac is like any salon polish application, the Shellac system features a Base Coat, Color Coat and Top Coat. Together with a UV Lamp, the system comprises a breakthrough in resilient color that remains flawless for two weeks and removes in 10 minutes. This has to be the most revolutionary offering for natural nail customers! Many want to know what the difference is between Shellac and gel manicures. Well, the Shellac gel hybrid does not require as much prep work to the nail... the process is just like a natural nail manicure with the exception of a UV cure with each coat. Shellac also soaks off quicker that other nail services. What does this mean for Salons? IMO -- Shellac is a Gold Mine! Imagine being able to offer clients a nail polish that doesn't smudge, peel, dent, knick, or even chip for 14 days! When I asked some local nail salon patrons how they would feel about being offered this type of service, their responses were frenzied. They did not even inquire about the price, they just wanted to know what salon has it and how fast they could get there... they all became possessed with excitement! This is a VERY desirable service, and CND has done a great job of getting press and media to deliver the news to consumers; "the 14 day manicure is here". I am confident most women will find a Shellac manicure a staple service before vacations, holidays, meetings, weddings, reunions or any event in which they don't want to worry about touching up their polish. I am personally looking forward to traveling WITHOUT a big bag of leaky nail polishes and remover (that ALWAYS leaks all over my suitcase). This used to be unavoidable, because Pre-Shellac, my manis & pedis never stayed in tact for any trip over 2 days! My CND Shellac French manicure was done with 2 colors, Negligee (a transparent pink with a very subtle iridescent) and Cream Puff (the opaque white used for the tips). Now, I have to admit that I was a bit bummed at how clear the Negligee appeared. I have on 2 coats in this photo. A white on white manicure is my preferred choice (1 coat Essie Waltz and 1 coat Essie Marshmallow was my signature). For now, there is a limited color selection currently available from CND Shellac (with more coming out in November 2010), so Negligee was my only option... though I think Shellac Romantique might make for a good alternative to give more opacity, (I will try next time). Retail -- Really -- YOU need to retail CND Solar Oil! So far, on day two of my Shellac French Manicure, I have no nicks, chips or scratches. Just INSANELY shiny and healthy natural nails! A VERY important step to keeping the Shellac manicure looking great, is to have your clients apply Solar Oil every day! Solar Oil contains a luxe blend of natural Rice Bran oil, Jojoba oil, Vitamin E Oil and Sweet Almond oil to help restore and repair nails and cuticles for a healthy looking manicure. In addition, the act of massaging Solar Oil into the nails daily actually stimulates nail growth while the natural oils condition brittle nails and cuticles. Every time Solar Oil is applied, it totally revives the beauty of any manicure! This is a great way to make sure your clients LOVE their manicure up to day 14 and it helps them nurture their natural nails. Click me to see the Solar Oil Retail Display. Another great marketing benefit of CND Shellac it that there is absolutely no damage done to the natural nail. Shellac is also 3 Free. It is free of formaldehyde, toluene or DBP. I like to call Shellac "The Kind Manicure"; your nail bed does not need to be mutilated with a nail file or drill at anytime. No glues, bonds, primers or offensive smelling fluids are needed. CND Shellac polishes go on just like regular nail polishes, so there is no damage to your precious, natural nail. Rev up your business and try the CND Shellac Starter Kit today! People WILL be calling your salon about it. Don't be left out of the Shellac Revolution! invention since the Internet, and for us ladies it just might be! Like most women, I like to look cute and put together. But as a single Mom of 2, I do not have hours (sometimes I don't even have minutes!) to put into getting ready. I love to have my nails prettily manicured, but who has the time to go to the nail salon every week? And do them myself? By the time I have 5 free minutes to paint my nails, it is bedtime - and then I wake up with the inevitable sheet marks! 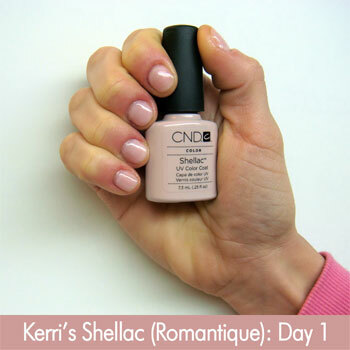 When I heard about the new CND Shellac system - a UV-cured hybrid nail color that claims to last 14-days - I was so excited. As in dreaming about it every night the week before it was released excited. I mean, even I can spare 30 minutes every two weeks for the perfect manicure! Finally, Shellac day was here. I had my hands manicured - filed my nails, clipped my cuticles, and made them look extra pretty. After all, if I am going to have a beautiful manicure last 2 weeks, I want to start with the prettiest palette possible! The process is amazingly easy (and in case you didn't notice, EASY is high on my list of necessities!) - apply base coat (just like polish), cure for 10 seconds under the UV lamp. Apply 1 coat of color, cure for 2 minutes. Apply second color coat, cure for 2 minutes. Apply top coat, cure for 2 minutes. Wipe thoroughly with 99% alcohol (this is the MOST IMPORTANT step) to remove the top layer film and DONE! My nails were beautifully painted in the exotic Tropix color, shiny, and DRY! For my first Shellac test, I immediately put my hand in my pocket to retrieve my watch and lip gloss. I will admit it - I was nervous. I am Queen of having creases and lines in my nail polish, because I always forget to have everything out of my purse or pockets before polishing. Not to mention having to change a diaper or fix a broken toy... With Shellac, IT DIDN'T MATTER! I stuck my hand in my pocket, got my watch, pulled my hand back out - and my polish was still PERFECT! The most amazing part about my manicure is how glossy it is. My nails honestly look wet. I have tried tons of top coats to obtain that high-gloss shine that lasts, to no avail. Shellac is different - it looks like I just left the salon. Finally, stress-free nails! YAY! Emotions at Pure Spa Direct have been running high ever since the announcement that CND would be introducing their new Shellac manicure system. All us ladies have been waiting with great anticipation to see the colors, feel the consistency of the polish, and see if it can really stand up to the everyday wear that our nails go through. The very first thing I did before anything was applied to my nails was rub all of them with a plastic-backed, lint-free pad that was soaked with 99% Isopropyl Alcohol. This made my nails clean and ready to be Shellac-Attacked. 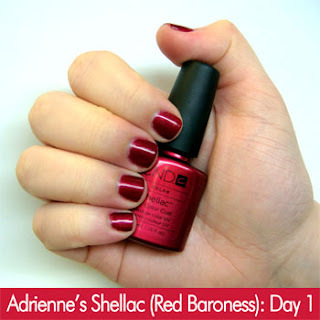 My color of choice was Red Baroness, a sparkling raspberry color that can change to a more cranberry tone, depending upon the light. It is absolutely gorgeous, the kind of color that I want to show off. Also, due to its varying shade, it is also a very versatile color. The process, in a nutshell, was: Base Coat, bake 10 secs, 1st color coat, bake 2 mins, 2ND color coat, bake 2 mins, top coat, bake 2 mins. Repeat on other hand. In essence, the whole process takes exactly 12 minutes and 20 seconds longer than a traditional manicure, BUT, no drying time and no worrying about inevitable smudges and dents! I don't know about any of you, but I have sat under the nail dryer for 20-30 minutes, and STILL wrecked my manicure before I even left the salon. The end product is absolutely stunning. I have been getting tons of compliments on the color and shine of the polish, from friends and strangers alike. And rather than having to do activities with extra care and focus, I have been able to throw caution to the wind, successfully combining my tomboyish nature and love of shimmering nails. As a note, the CND Solar Oil is ESSENTIAL!! I have very dry hands and cuticles and using the 99% Isopropyl Alcohol definitely does not help my situation. After one application of the oil, however, my nail-beds looked and felt super moisturized. I will be applying it every day, multiple times a day, to ensure that my cuticles stay as fresh and gorgeous as my Shellac Manicure does. Labels: CND, CND Shellac, Does shellac work?, long-lasting manicure, perfect manicure, Red Baroness, red polish, Shellac, shellac attack, shellac Product Review, Shellac Review, uv lamp, What is shellac?